Two steps forward, fifteen back today, but you should know about … NEW APPS THAT WERE ON MY FB PAGE ALL ALONG! Tale of Mysticism & Mayhem for … oh, maybe next Thursday? We’re talkin’ about it. Plans are heating up. I’ll let you know if they actually get hot. It would be a free day Thursday September 18th, with increased savings available for the weekend through Amazon’s “dribble it out” program. Why do they make it so hard to find the NAME of something? So, think about free to lowered prices on Mogollon, the ebook with the fabulous cover featuring Native American actor, model & philanthropist Rick Mora. While the cover of this book is amazing, I’d say that the interior of the book––it’s content––is just as stellar. If you want the maximal immersion, get the paperback version. The cover is KILLER. Front and back. 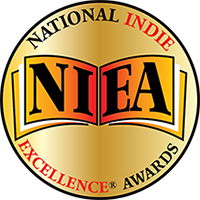 Mogollon won the Visionary Fiction Category of the 2014 National Indie Excellence Awards. All that beauty and a prizewinner, too. How about submitting to them for Mogollon‘s free day? Good idea, but while I was on the site, I noticed that they have a new free app that you can install on your Facebook Page, that converts it into a mini-version of your Amazon sale page. Whoo-hoo! “You can install it in thirty seconds.” Or two hours, if you were born before 1974. People in my age group should take two or three years to install that puppy. I got it up in in one day! The only problem is that while loading my books, I assumed that the app used the first loaded is the bottom position on the stack method, which made sense to me. I loaded my books, thinking I was ordering them so that the most recent ones that I wanted everyone to see would be the top of the list, and the older ones on the bottom. That isn’t what the app did, so … I’ve got the books that I want you to see most on the bottom. That’s why people go crazy and run screaming through … fill in your own place for running amuck. YOU FIND THE NEWLY DISCOVERED, ENTICING APPS UNDER THE "ABOUT" ON MY FB PAGE AND ABOVE THE PHOTOS. CLICK THE BUTTONS TO EXPLORE. I was filled with joy, having successfully installed that Freebooksy App on my Facebook Fan page. That’s THIS FACEBOOK PAGE, MY FAN PAGE, a opposed to THIS OTHER FACEBOOK PAGE, MY PERSONAL PAGE. In doing the installation, I looked at my page for the first time and discovered the already existing apps on it that should bring me much closer to … heaven? I dunno. You, I hope. This is what they look like. (To the left) You find them on the left side of MY FAN PAGE under the ABOUT bit and above the PHOTOS. I love having people join my mailing list, going to extraordinary lengths to write funny, informative newsletters with special offers in them. In the process of installing Freebooksy app, I discovered that I had a previously semi-installed thing where people could sign up for my newsletter from my Facebook page. This is marked Join My List on my page. All I had to do was complete the installation process I’d started in prehistory. All I needed to do was sign in with Constant Contact, which involved CC accepting the password and username that it has been accepting for the last ten years. How many tries did it take? Let me count the stars in the sky. But I got it working. You can sign up for my newsletter and be first to know my news and get special deals available only there. Does anyone hate the Constant Contact mailing service like I do? That intensely? I find it horrendously hard to use. Expensive. They do have great templates and lots of them, but learning them? There’s the on-going thing about it not accepting my passwords. I’d hop over to the free Mail-chimp in in a minute, but it took all of my cyber-muscles to figure out how to use Constant Contact’s templates to send out the lousy three newsletters I do a year. Having to learn a new system from scratch would kill me. Having said that, I expect the Thought Police from Constant Contact to bust me any minute. 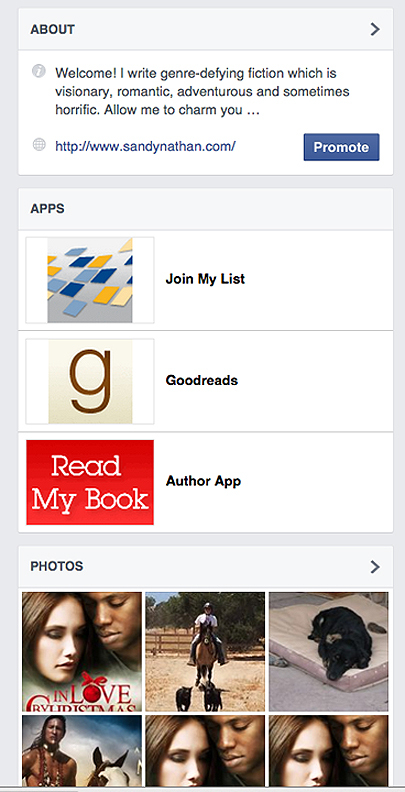 The Goodreads App was the final app already existing on my FB Fan page. It was hooked up, too. It takes you to my Goodreads author page, or a facsimile. I never went back to Goodreads. Then there was all the uproar about the young first-time author who got a bunch of low ratings on a book that wasn’t out and no one had any information about. She complained on her own blog, to find her book listed on really nasty lists. So much for the authors’ marketing bonanza. Any Goodreads experiences to share, readers? NEXT TIME, WHICH WILL BE VERY SOON, I’LL LET YOU KNOW IF WE’RE HAVING THAT PROMOTION NEXT THURSDAY! YES! Last Tuesday, Native American model and actor Rick Mora and Rev. May Leilani Schmidt were on Leilani’s radio show, Universal Spiritual Connection. I called in and chatted for a minute. We discussed spirituality and other topics. Out of that, Leilani scheduled her shown on Tuesday, June 24th 2014, as a three way discussion between Rick, herself and me, Sandy Nathan. I thought, We’ll be talking about spirituality. 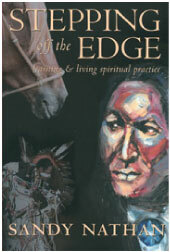 I wonder if people would be interested in my book Stepping off the Edge: Learning & Living Spiritual Practice? That’s really about spirituality. Stepping was published in 2006. For my first book, I wanted to write something significant. Something that really mattered. I wanted to help people. I also wanted to tell my story. And thus, Stepping off the Edge was born. It’s the first and only book in the memoir/self-help/New Age/spiritual/religious/applied psychology genre. It’s good, too. The darn thing won six national awards out of the starting gate. Rendered me speechless, which is hard to do. 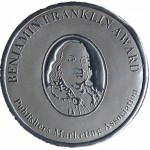 Benjamin Franklin Award Finalist - I've got bunch more stickers like this. I'll spare you a show and tell. 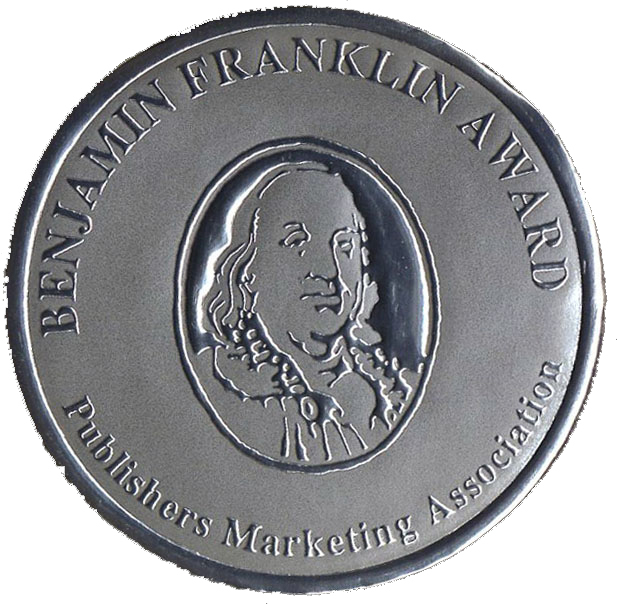 2007 Benjamin Franklin Award Finalist in New Age (Spirituality/Metaphysics) The Benjamin Franklin Award is one of the largest and most prestigious awards for independent presses. Bronze Medal Winner in Self Help, 2007 IPPY (Independent Publisher) Awards The IPPY Award contest is the largest and oldest for indie presses. After its triumphant birth, Stepping off the Edge was eclipsed by my passion for writing fiction. It’s moldered on the Amazon site since, inexplicably rising to bestseller status in Applied Psychology every once in a while. I have no idea why; I’ve never promoted it. Is now the time for Stepping to shine? I have no idea, but two designers are working on new a cover and interior. It’s well on it’s way to a triumphant return as Stepping off the Edge: A Roadmap for the Soul. Will the new book emerge before the June 24th show? Beats me. I’m working on it. The original Stepping off the Edge bears a 2006 copyright. It was my first book. I thought I should start my career with something meaningful. I wanted to create a work that was deep and significant, expressing eternal truths. I wanted readers to see who I was and remember that when they read my future works. Stepping did that and much more: the darn thing won six national awards, quite a surprise for a first time author. The 2014 version of Stepping off the Edge is very similar to the 2006 one. The thing about eternal truths is that they’re eternal. Reviewing the manuscript showed me that while my personal issues are different today, probably more people are struggling with the material in the original Stepping than when I wrote it. The nasty eBay addiction I studied meticulously in the first Stepping is tamed, but millions more people have discovered the joy of spending 90% of their time in front of a computer screen, grabbing at shiny trinkets. They’re/we’re like rats in some experiment, trying to reach nirvana one pellet of food at a time. Call it gaming, participating in social media, book marketing, personal branding, or plain ol’ eBay addiction, the possibilities for destroying the meaning of your life on-line have multiplied over the years. You can still apply what I say in Stepping to dig yourself out of your hole. Same with writing. Much of the first Stepping is about my struggle to see my work in print. I go on and on about achieving my dream of becoming a famous author, making millions, and eventually dominating the world. No. Wait—that’s what they do in gaming. Today, millions more share my literary agony. I know: they’re self-pubbing like crazy, flooding the market with books that compete with mine. No need to change the bits in the old Stepping that concerned the Author’s Path. Stepping off the Edge is awash with Native Americans. Its design has a Native theme and chapters and chapters take place at a spiritual retreat held by this country’s First People. Bill Miller (Mohican/German), my all time favorite musician, artist, and speaker, was the spiritual leader of that retreat. He gifted me with an interview and testimonial. Want to know why a San Francisco-born, Silicon Valley-raised woman is so obsessed with Native Americans? I’d suggest reading my bio, which is somewhere in this book. It talks about my fall from American royalty into the desperate condition of being a regular person. Recovering from that fall has formed most of my life and turned me into a writer. I wrote this book and then a few dozen other books and manuscripts from my angst. I dubbed my first fiction series the Bloodsong Series. Why? It’s written in my blood. After I’d drafted a few thousand pages of the Bloodsong books, I had this giant Ahah! At least half of the characters were Native Americans. Why? I lived on the San Francisco peninsula. I don’t think I’d ever seen an Indian. I realized that I had lived the lite version of what happened to Native Americans. They had the kingdom — the entire continent — and lost it. I know how that feels. They were treated abominably for centuries, and had the worst abuse hurled at them. Then they were asked, “What’s the matter with you? Why aren’t you doing better, you lazy bums?” I know all about that, too. One more thing: I do not sit you down in this book and teach you how to meditate, pray, or figure out what’s sacred to you and what you should do with your life. Some things you have to do for yourself. This book is a roadmap containing everything that actually helped me heal and move forward. Some of it is from my years in school, while other portions may be highly personal spiritual experiences. That’s what I offer you. You have to apply your mind and heart to what’s in this book and transform it to fit your circumstances. Having set the stage, here’s the Author’s Note to the original Stepping of the Edge. It’s as valid now as it was on the first go round. I want this book to touch you and heal you. I’d like my writing to open your heart so that the love inside flows out and transforms your life. I want my words to make you laugh and cry and feel and become the person you were meant to be. I want to move so many people that the world of hopes and prayers becomes real and we live together in paradise. Negotiation coaches tell you to set your aspirations high. That way, you’ll have a better chance of achieving them, or at least you’ll get closer than you thought you could. My goals are set out above: You can tell me if I attain them when you’ve read this book. Right now, I want to tell you about it. At first, I wanted to write a book about a Native American spiritual retreat called the Gathering. As I wrote, I realized that what I was writing about was bigger. I was writing not just about a particular retreat or spiritual activity, but also about how we can become mature, spiritual beings. What must we humans do to grow up? If that is too big a question, how did I grow up? I’ve grown up over thirty years of spiritual seeking. I can tap into my inner well of bliss. I’ve got a great life. My husband and I have been together for forty years and are still in love. My family’s wonderful. And I still experience my old crud now and again, but that’s not the norm. This book is a trip. I cover the bases of prayer, meditation, worship, spiritual retreat, dedication of one’s life to experiencing the divine, taming the mind … I write about many things, using stories and examples that anyone can comprehend. I hate books that are so highfaluting that the average person can’t understand them. Life is hard enough without me making it worse with intellectual pretension. I suggest that we get going. Who knows how much time we have for our journey? None of us will come out of this earthly voyage alive: We’d better start now. Wa-hoo! 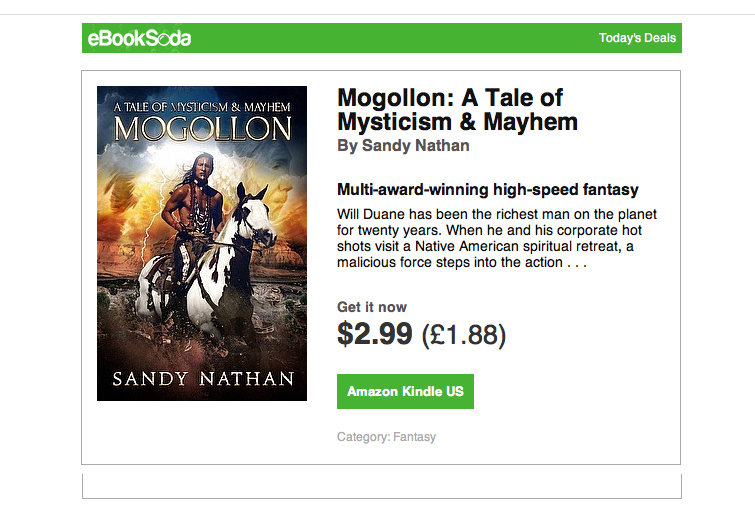 Mogollon: A Tale of Mysticism & Mayhem Is on eBookSoda Today! Here’s the book’s beautiful cover, made more beautiful by the radiant fellow on the horse, Rick Mora. 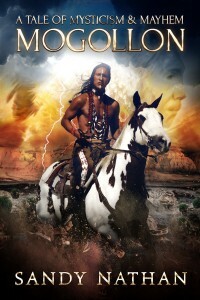 Rick is a famous Native American actor and model, the embodiment of one of Mogollon’s characters. Which one? You’ll have to read Mogollon to find out. You can find Mogollon on the US Amazon site or on the UK site. Same thrilling adventure in either place. What are reviewers saying about Mogollon? From the US listing of Mogollon. Almost all of my reviews are on the US site . . . UK reviewers? I’ll have more to say later; this is my day in the Big City. Will report my experience of eBookSoda.